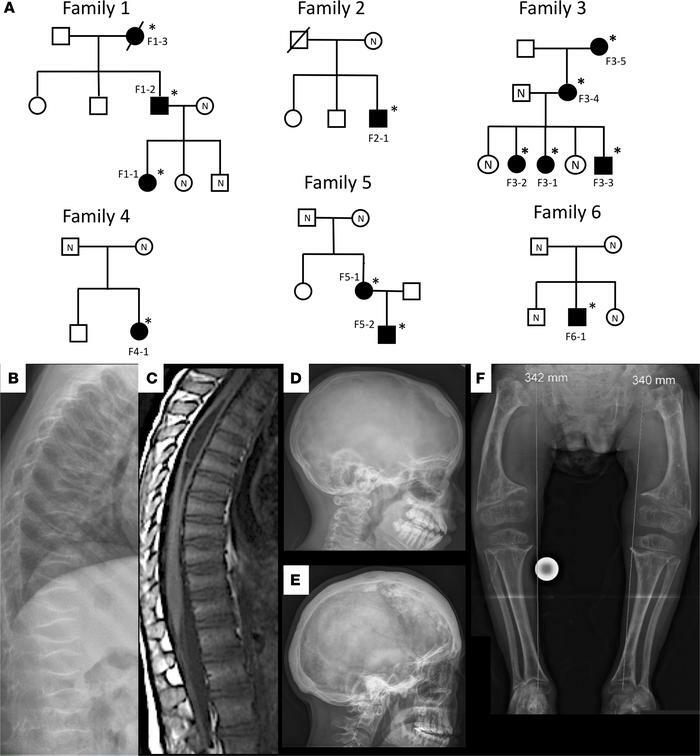 Characteristics of the 6 families with osteoporosis and a heterozygous SGMS2 mutation. (A) Pedigrees of the 6 families. Squares represent males, circles represent females, black symbols represent affected family members, white symbols represent unaffected family members, and slashes deceased family members. Individuals with a confirmed mutation are marked with an asterisk, and mutation-negative individuals are marked with N. Codes refer to individual data in the text and in Tables 1 and 2. (B) Patient 4-1 with a p.Arg50* mutation has at 6 years severe osteoporosis with spinal compression fractures involving all vertebrae. (C) Patient F3-1, with the same p.Arg50* mutation, has at 7 years on spinal magnetic resonance imaging multiple compression fractures involving nearly every thoracic and lumbar vertebra and moderate syringomyelia of the upper thoracic spine involving levels T3-T8. (D) Patient F3-2 has at 13 years sclerotic lesions in the left frontal bone and the right parietal bone. (E) Patient F5-1 with the Ile62Ser mutation has at adult age severe skull hyperostosis with sclerotic and lytic lesions throughout the skull. (F) Patient F6-1 with the p.Met64Arg mutation has at 11 years severe spondylometaphyseal dysplasia with poorly mineralized bones, short and wide long bones with metaphyseal widening, abnormal bone texture, and bilateral coxa vara.